Upon arrival at Beijing International Airport, you will be met and transferred to hotel by a local driver. After check in, the rest of the day is free at leisure. After breakfast, we will pick you up from your hotel and kindly wait at the hotel ground level lobby for the pickup service. After breakfast, spend some time at leisure till met and transferred to Beijing International Airport by a local driver for your flight to Xian. Upon arrival at Xian International Airport, met and transferred to your hotel by a local driver. Rest of the day is free at leisure. After breakfast, spend some time till met and transferred to Xian International Airport by a local driver for your flight to Guilin. Upon arrival at Guilin International Airport, met and transferred to your hotel by a local driver. Rest of the day is free at leisure. After breakfast, we will pick you up from your hotel and drive about 40 minutes to MoPanShan Pier. Follow the tour guide to your cruise boat with pre-allocated seats. The cruise will last about 4 hours. You will enjoy the picturesque limestone mountains, peaceful green fields, farms and villages with water buffalos, cows wondering around on both side of the river bank. Lunch is offered by the cruise company on board. After debarkation, your guide will show you around the famous West Street. In the late afternoon, you will transfer back to your hotel in Guilin. Rest of the day is free at leisure. After breakfast and check-out, meet up with your tour guide and then visit the famous Reed Flute Caves that make you feel like you are in a fairy world, where you can taste clear water of origins. Next, move to Elephant Trunk Hill, the symbol of Guilin located in the middle of the city. 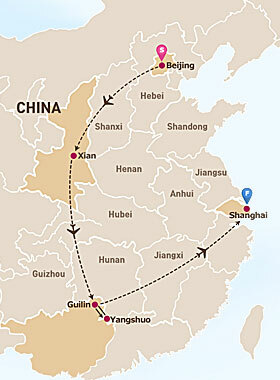 After the tour, transfer to Guilin International Airport your flight to Shanghai. Upon arrival at Shanghai International Airport, you will be met and transferred to hotel by a local driver. After check in, the rest of the day is free at leisure. After breakfast and morning enjoy some free time at leisure, we will pick you up from your hotel and kindly wait at the hotel ground level lobby for the pickup service. After breakfast, spend some time at leisure till met and transferred to Shanghai International Airport by a local driver for your flight to next destination. * High Season surcharge may apply depends on your travel date. Please double check your final price with your travel agent. * Some blackout dates may apply. We will let you know the possibility upon the time of booking. * The itinerary/accommodation is subjects to change due to local circumstances. * This is a group joining tour and people are primarily from English speaking countries. Your group may be joined with other tour groups during the tour. Please make a note that your seat assignment may be changed once other groups join the tour.